In 1934 the Haven of Rest, now HAVEN Today, went on air to share a message that’s all about Jesus. Now, 85 years later, Haven Ministries is reaching more people every day than ever before. Join Charles Morris as he not only looks back but also looks to the future of this ministry in this week’s anniversary series. Part 1: He was a drunk and separated from his family. But 85 years ago, the man who became known as “First Mate Bob” met Jesus, and his life was forever changed. Tune in to hear the remarkable testimony of the man who founded Haven Ministries. 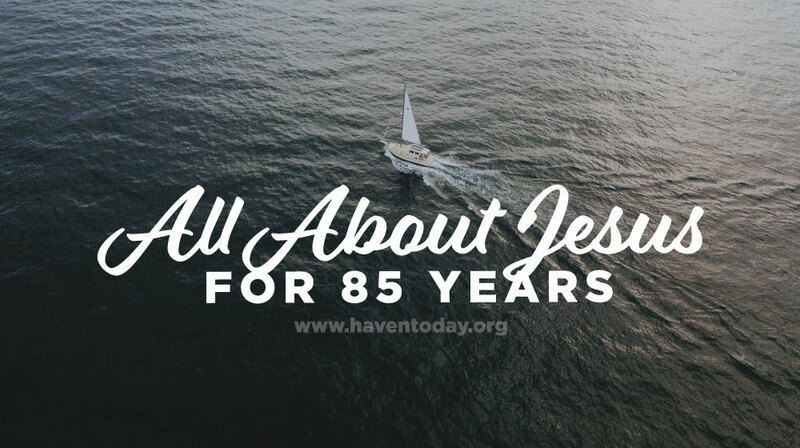 Part 2: As Haven Today turns 85, we are looking back at what the Lord has done through this radio ministry. But we can’t do that without also going all the way back to the “old rugged cross.” Join Charles Morris and the late Paul Evans when you listen. Part 3: He felt a call to help people in China know Jesus after WWII but found it difficult to leave the Haven of Rest. Learn more about Bob Bowman–an original quartet member and founder of Far East Broadcasting Company–on today’s program. Part 4: Our mission is to shine the spotlight on Jesus every day, so that people will see his glory and have their faith reignited all over again. Today’s program is no exception as we’re joined by the late Ray Ortlund, the third speaker of this radio program. Part 5: Thanks to satellites and the internet, Haven is now able to broadcast each day while dealing with current events. But one thing has not changed in 85 years … we’re still sharing the great story that’s all about Jesus. Shipmate Bob leads us on a behind the scenes look at how The Haven of Rest radio program was produced back in the early days of the broadcast. Some of this footage has not been seen in public for decades and was recently discovered.